Our Playground Consultant, Anna Hosker, worked closely with Red Marsh Specialist School in Thornton-Cleveleys, Lancashire to redevelop 3 outdoor play areas at the school. The SEN School is an outstanding small school for children aged 2-19 with complex educational needs. As the school cater for a range of pupils with differnet individual needs, they wanted to create inclusive and stimulating playground environments where the children can play safely, with minimal injuries, and throughout all weathers. We transformed 3 playground areas into safe and engaging spaces for play and learning year round. 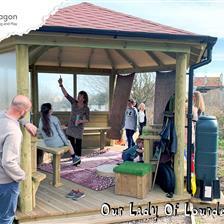 The school felt the EYFS outdoor area was in serious need of rejuvenation. Before we began our development, the surfacing in the area was a hazard to the children due to the fact it was breaking apart and the children were able to pull it up, play with it and try to put it in their mouths – like all young children do. The surfacing was in desperate need of repair, it was also becoming uneven. The children could no longer use their bikes and trikes: preventing the children from enjoyably developing their cardiovascular fitness and important gross motor skills. Along with this, the outdoor area was no longer vibrant, inspiring and inviting due to looking in need of repair and run down. To solve this problem, we removed and replaced the old, dated surfacing with our amazing Wetpour Playground Surfacing. The Wetpour we placed in this area is a vibrant green with colourful red, blue, purple and yellow splashes to inspire imaginative and creative play. 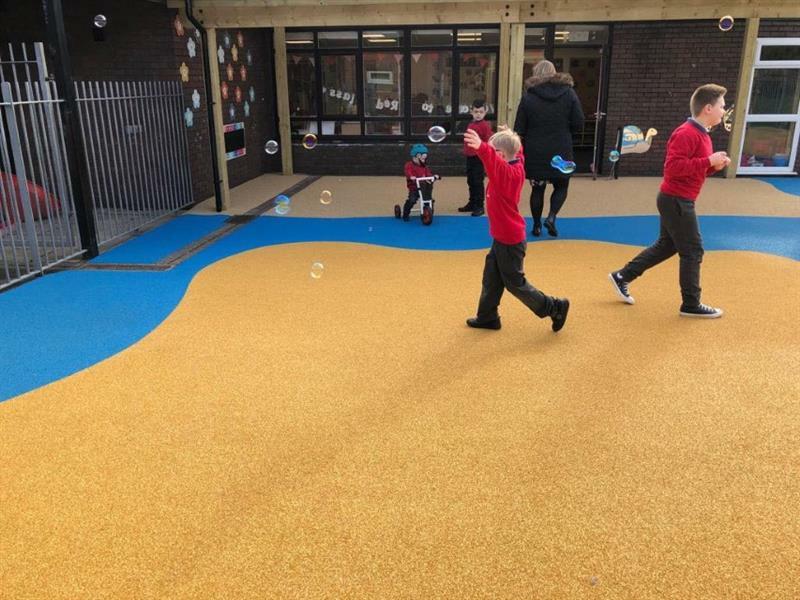 With a new surfacing, the EYFS children can now access their outdoor environment safely all-year round without the risk of choking on pieces of the old surfacing or being prevented from accessing the area due to the hazardous flooring. As the playground surface is now level, the children can race their bikes and trikes around: developing their upper and lower body strength, cardiovascular fitness and gross motor skills. Neighbouring the EYFS Playground is the KS1 play area. Beforehand, the main part of the playground was tarmac with a small triangle area of natural grass that had been fenced off. We extended the playground by removing the fence and replacing the natural grass with our soft to touch, comfortable Artificial Grass Surfacing and Wigwam Posts. The main tarmac area of the playground was resurfaced with our spongy, safe Wet Pour Playground Surfacing. 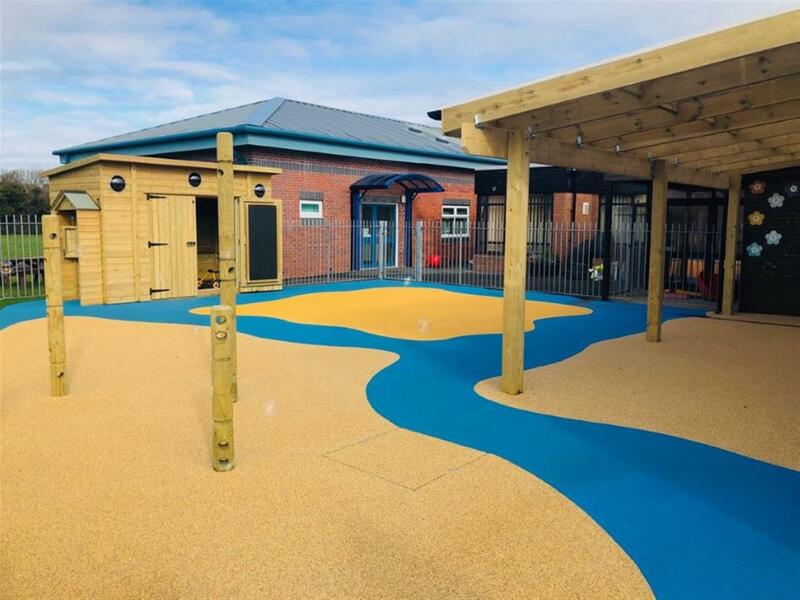 The surfacing is a wonderful blue and beige colour with a green Wet Pour path running to the artificial grassed area: these colours have ensured that the children with sensory issues will not be overstimulated or overwhelmed by bright and vibrant colours. The school were struggling to store their outdoor equipment such as bikes and trikes as well as having a lack of resources to inspire imaginative and creative play and encourage communication and language skill development. 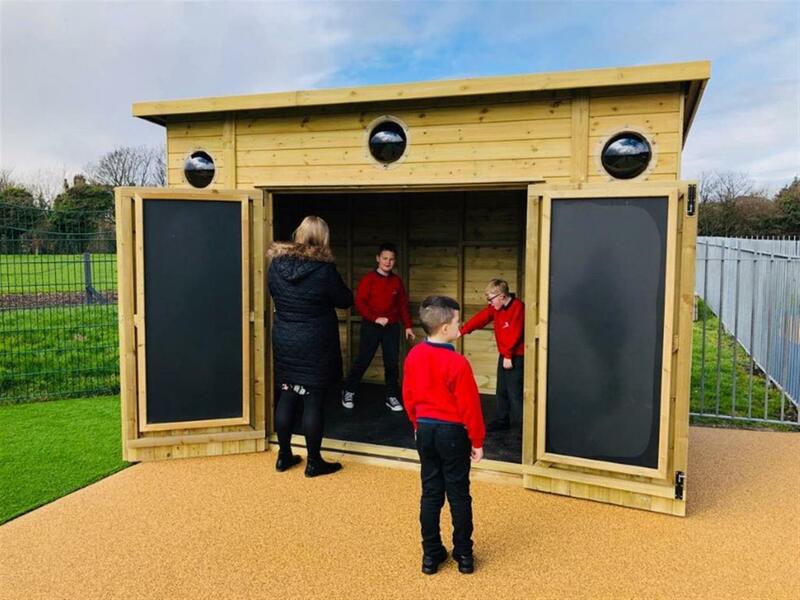 After recommending our amazing Play Cabin, the school decided that it would be the perfect addition to their playground as it can act as both a storage area and a playhouse. The children are able to peek out the bubble windows to others playing around or stand and mark make on the chalkboard doors while inside the cabin there is enough room to store equipment like bikes and trikes. The Wigwam posts provide the children with a small space, giving the children a sense of comfort. Including these excellent posts on the artificial grass area ensures the children have an all-weather break away space to relax underneath. With a bigger area for learning and play and a wonderful selection of Den Making Playground Equipment, the schools needs for this area have been met. Finally, we renovated the schools KS2 Outdoor Area. As the area previously didn’t have any shaded area, we installed a magnificent timber canopy against the school building to create a shelter from both the sun and the rain: depending on what the British weather has instore. Like the KS1 playground, the area was a plain, boring tarmac space, which didn’t inspire the children to participate in imaginative play games. We created an inviting, vibrant area by installing a fantastic range of our spongy Wetpour Playground Surfacing and Artificial Grass. The KS2 area now has a wonderful Wetpour river or roadway for the children to race their vehicles around while encouraging participation in imaginative play games. The roadway is an excellent way to encourage the children to use bikes and trikes in the playground – developing cardiovascular fitness and gross motor skills. 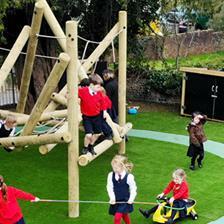 The artificial grass provides the children with a comfortable, soft to touch area to sit and relax or play within. To encourage the children’s imagination and creativity, we installed a fantastic set of Den Making Posts. By working together to build a den, the children will advance their communication and language skills while improving their fine motor skills through the threading and weaving of materials through – important skills needed for writing. For children with special educational needs, dens, cubby holes and small spaces are great additions to the playground as they provide children with a sense of comfort. The school also wanted a playground storage solution that would not only help keep the outside area tidy but also encourage further language and communication skills. Our Play Cabin was the perfect addition for this because it has huge storage space with additional features that include chalkboard doors and bubble windows. 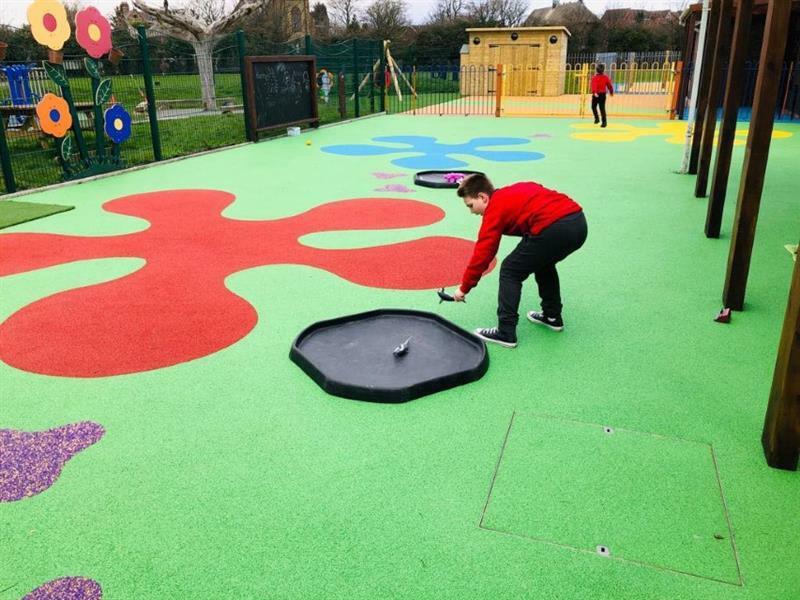 Our playground flooring had a consistent design throughout each area and includes an impact absorbing base to protect the children from injuries as they play. This amazing and colourful design has created an engaging and safe place for children with special needs to enjoy year round. 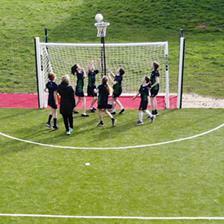 You can view our huge range of playground flooring options here. If you are looking to create a fully inclusive and stimulating playground environment for children with special educational needs, Contact Us to speak with one of our SEN experts. You can also view our amazing range of Outdoor Products for Special Needs Here.